The worlds first winter hardy Gardenia! A real breeding breakthrough. Bushy, small leaved, evergreen foliage, great in small pots, in full sun. Feed well in Summer. Supplied as a pack of 3 plants in 9cm pots, 2 years old, 15-20cm tall. 'Kleims Hardy' is the world's very first fully hardy Gardenia variety and can survive outside in temperatures as low as -10C! Just as stunning and as fragrant as its indoor relative, Gardenia Kleims snowy white, waxy flowers completely smother its exquisite evergreen leaves from early June onwards. The scent of gardenias is so gorgeous its often used in perfume, so imagine sitting on your patio this summer surrounded by its intoxicatingly sweet fragrance heavenly! 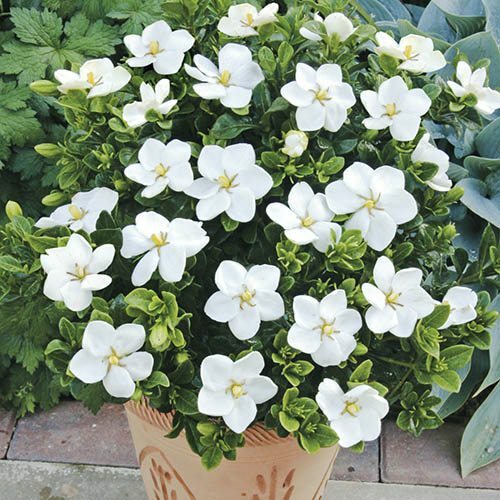 A beautifully compact shrub, Gardenia Kleims Hardy is both very easy to grow and care for. Simply plant it in a pot or a garden border, preferably using ericaceous compost, and it will happily grow and flourish outdoors all year round.